WiscWeb uses the The Events Calendar plugin to allow users to create and display events on their pages. This document will walk you through inserting the calendar on a page, adding events, and using shortcodes to change the display of your events lists. 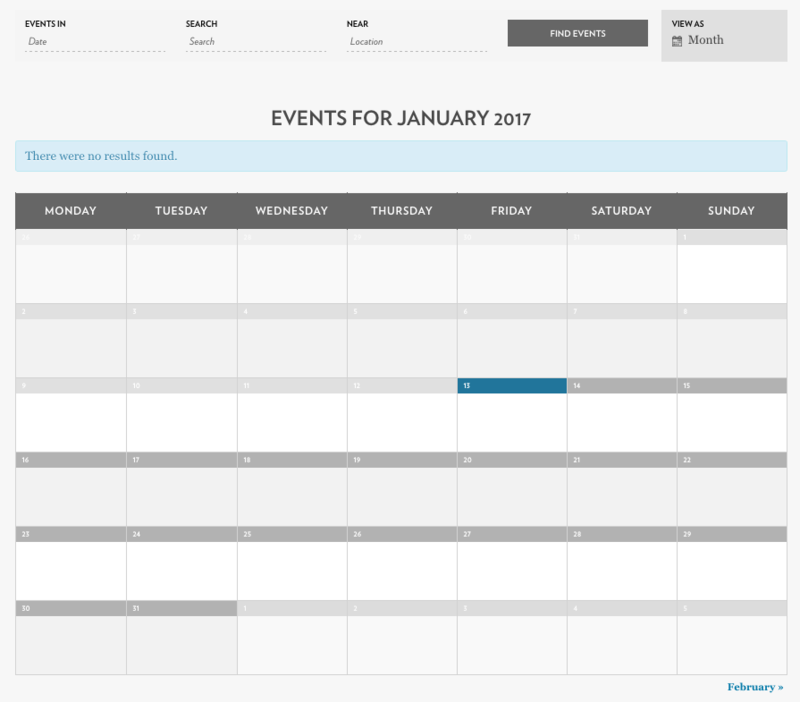 The "The Events Calendar" plugin is a useful tool to use to schedule and display events that you want to make your audience aware of. 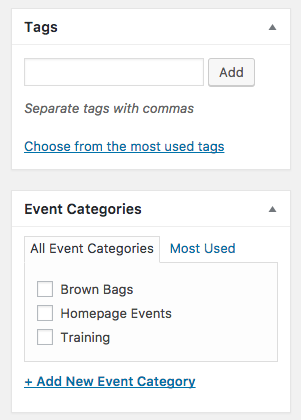 You can use categories and tags to differentiate your events, and use shortcodes to have those events displayed in different ways. Please note that by default, this plugin will post an events calendar on a page that has been given the slug (file name) /events. This means that if you were to create a page and title it Events, your calendar items will be displayed there. Later on in this document, the shortcodes will show you how to display events in different ways and on different pages. Click on the Events menu option on the left. You are presented with a list of all of the events that you have created. From this list you can edit any of those events, or click on the Add New button at the top to create a new event. 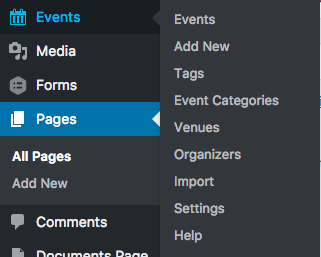 On the Add New Event page, you should add an event Title, the general event information, the event date and time, set recurrence, create a venue / location or use a saved one, create an organizer or use a saved one, enter an event website, enter event costs, and enter an excerpt (displayed summary) of the event. Once you have that information entered, scroll up to the top and in the right side of the screen you have several more setup options. At the top, you can Publish, Save Draft, or Preview the event. You can also add tags and categories to further differentiate an event. Once you are ready for this event to be active, click Publish. Shortcodes are text values used in conjunction with plugins that allow you to display content from those specific plugins. In the case of the "The Events Calendar" plugin, shortcodes will allow you to display your events in various ways. Again, by default your events will display in a monthly calender view on a page that has the title Events. To view a list of the various shortcodes available for this plugin, you can visit this page. A few examples are displayed below. This shortcode will post the events that were created in a list view (tribe_events_list), remove the top bar of the calendar (tribe-bar="false"), and limit the items displayed to only this with the Category value set to training (category="training"). Google recently announced that as part of a number of other changes, they will no longer be supporting keyless access to their maps starting on June 11, 2018. Users will need to have a valid API key and enter their credit card information for all projects. Users can request their own API key via Google and use a free pricing tier if they desire. The Events Calendar site has a walkthrough to assist with this process. Map functionality can also be disabled with The Events Calendar by following this path: Events --> Settings --> General, scroll down to the Map Settings section, and uncheck the option for "Enable Google Maps."